As a solar eclipse crosses the United States on 21 August 2017, Curator Jonathan Taylor takes a look at what the Babylonians thought of this celestial phenomenon. When I read ancient texts, it always strikes me how the people whose lives I glimpse in them are so instantly recognisable. Yet sometimes theirs is an alien world. The solar eclipse is one such moment. 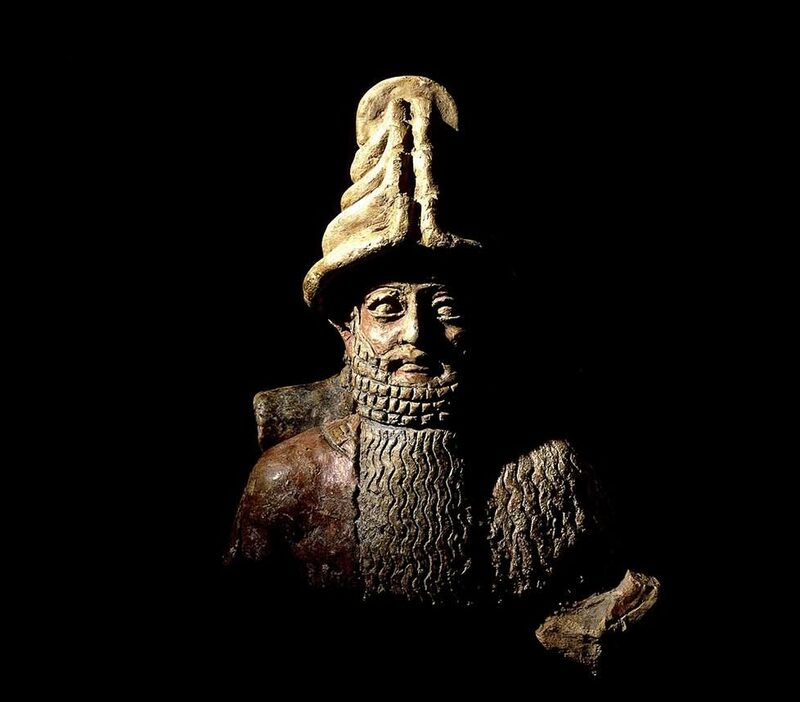 Shamash, judge of heaven and earth. Fired clay statue from Ur, c. 2000–1750 BC. Shamash (in the centre) rises through the doors of heaven. 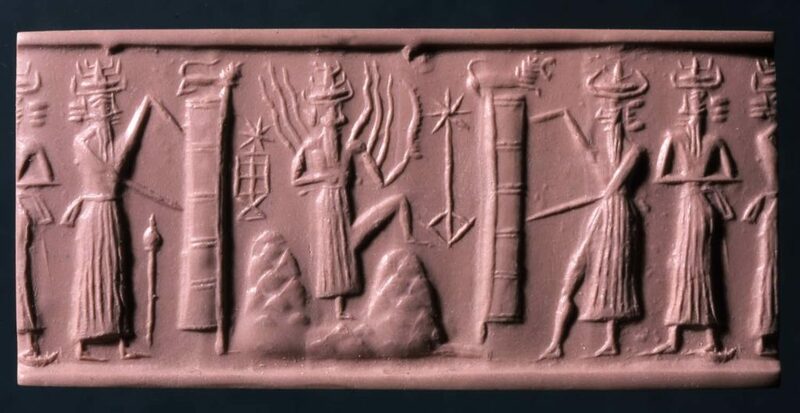 Modern impression from a greenstone cylinder seal from Sippar, c. 2300 BC. A ritual for fending off any evil that may strike during a lunar eclipse. 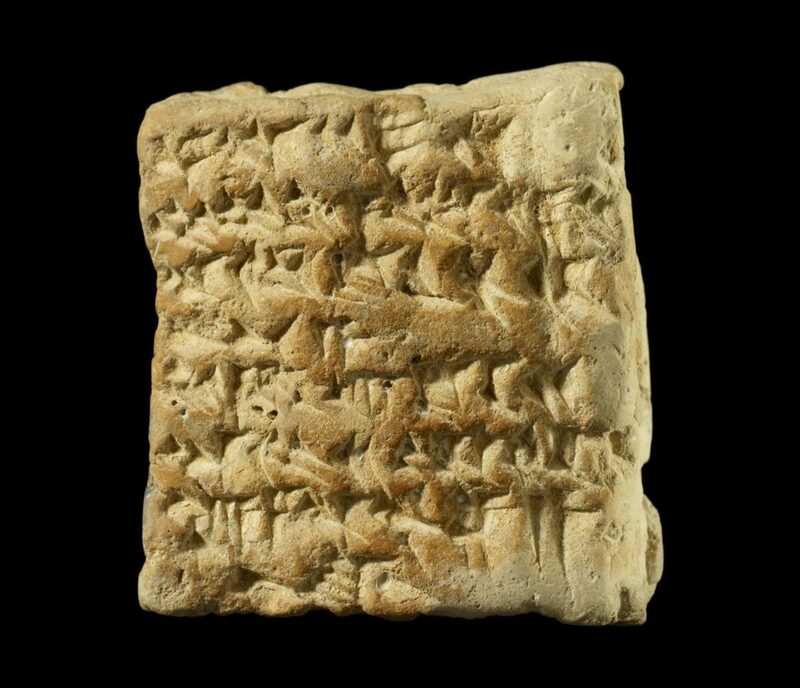 Clay tablet inscribed with cuneiform writing, from Uruk, c. 200–100 BC. Sky and earth both produce portent; though appearing separately, they are not separate (because) sky and earth are related. A sign that portends evil in the sky is (also) evil on earth, one that portends evil on earth is evil in the sky. The ancient Manual of the Diviner. 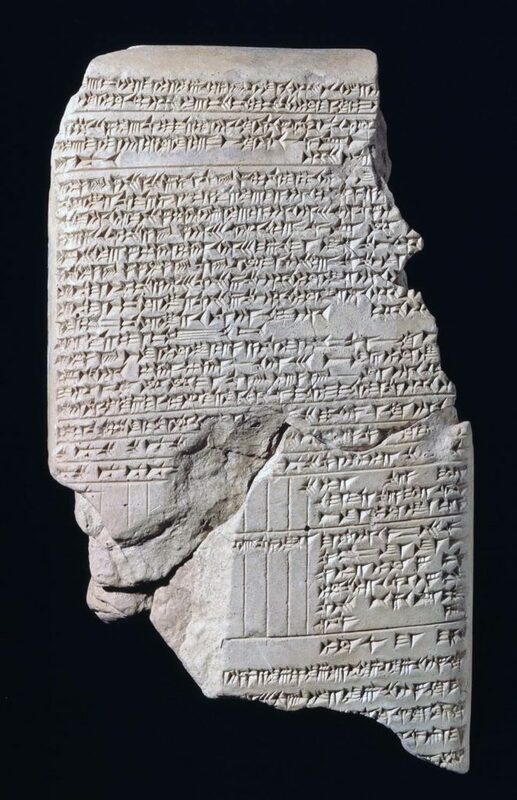 Clay tablet inscribed with cuneiform writing, from Nineveh, 7th century BC. Year 243 [=69 BC] On 20th Nisannu in the 9th hour the child was born… that year on 28th Abu [=20 August] a solar eclipse when watched for was not seen in the end of Leo… that child… good fortune… good fortune will diminish. A personal horoscope for a child born in 69 BC. 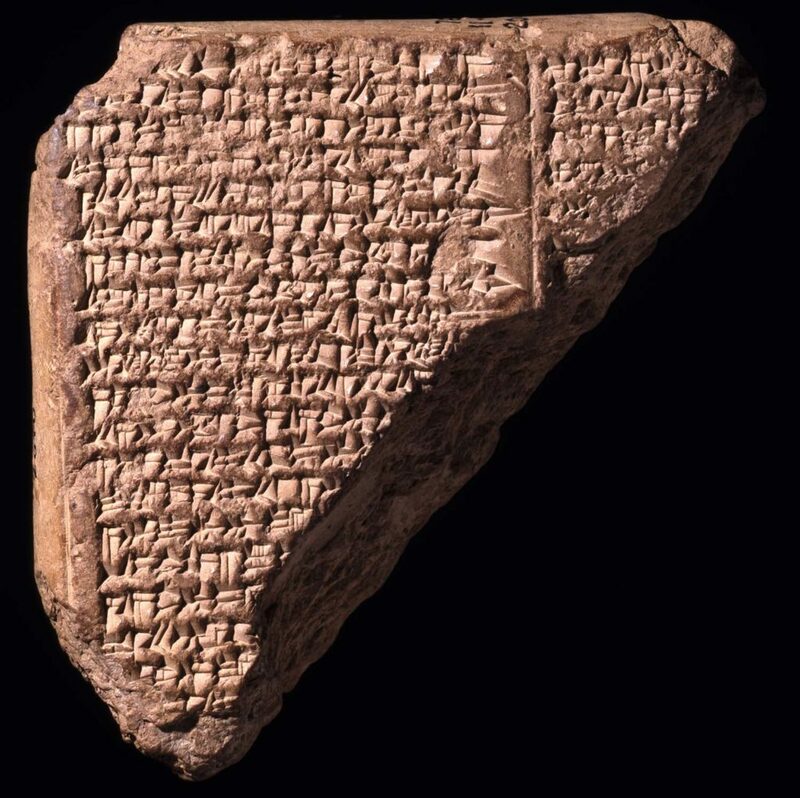 Clay tablet inscribed with cuneiform writing, from Babylon, 69 BC. In the ancient world the Babylonians were famous for their stargazing skills. Their seven-century-long programme remains one of the longest series of systematic astronomical observations in all history. This knowledge was prized from India in the east to Egypt and the rest of what was then the Greek world in the west. The 2nd-century AD astronomer Ptolemy eagerly drew on Babylonian astronomical records dating back to 747 BC, and much else besides. His Almagest (the name later given to it in the Islamic world, from where it came to Europe), dominated astronomy before Copernicus’s revolution in 16th century AD. The Mesopotamians would have scoffed at doomsday theories circulating again now at the eclipse (previously debunked by NASA). Nibiru (actually Nebiru ‘Crossing’, a name for the planet Jupiter) was a favourable planet, and they knew its motions well. During the Assyrian empire, the rituals normally performed to protect the king during an eclipse were not needed when Jupiter was visible. This tablet is the earliest surviving diary of systematic astronomical observations. 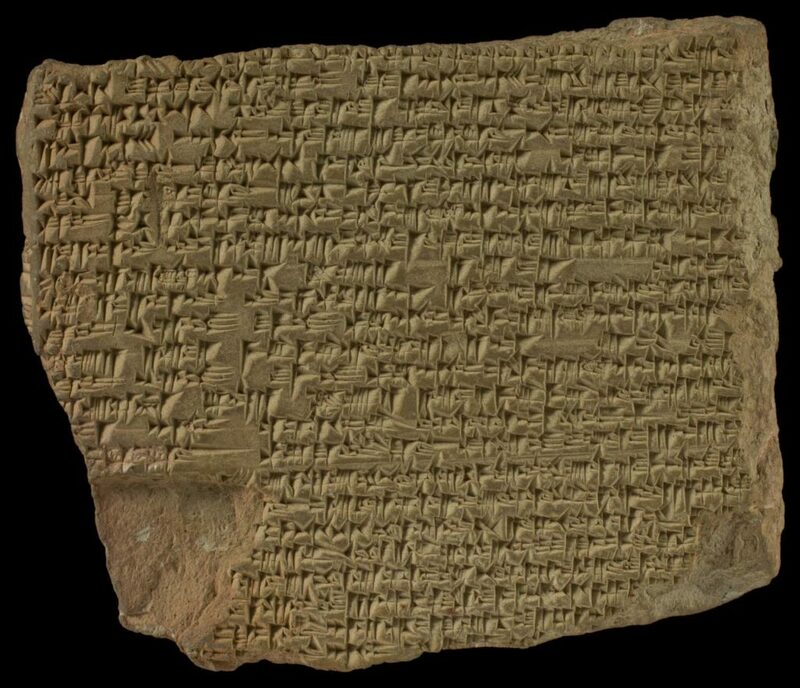 Clay tablet inscribed with cuneiform writing, from Babylon, 652 BC. The Babylonian day was divided into 360 units. The same units measured the orbit of the sun, meaning angles of up to 360 degrees (yes, you can ultimately thank them for that bit of maths). Likewise the idealised year in astronomy had twelve 30-day months, making 360 in total. The Babylonians knew well enough that reality was more complex, and had correctly identified how many extra months needed to be added, and when. Timing was crucial. Throughout the year specific days were lucky or unlucky for doing various things. Astronomy and astrology were one system. Pierre Brebiette (d. 1642), Aut Deus naturae patitur. 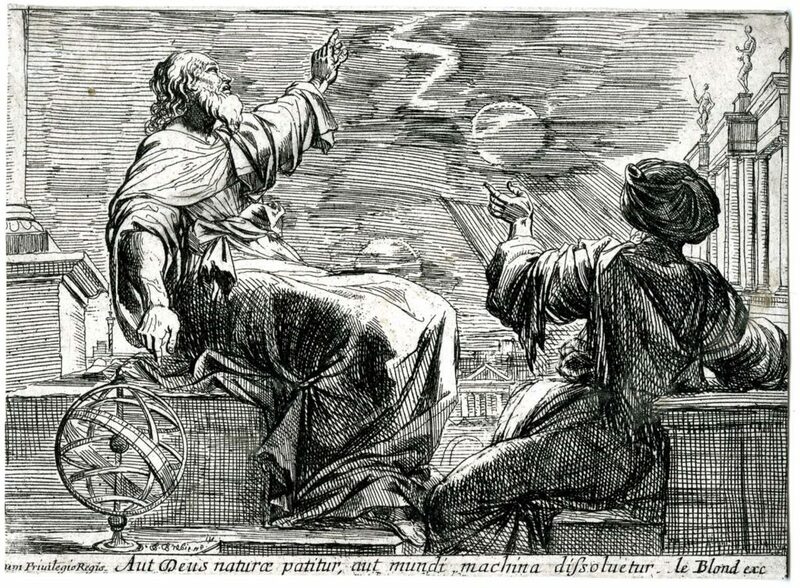 Two philosophers witness an eclipse with an antique city in the background. Etching, 1617–1642. The last major city in the path of the August 2017 eclipse is North Charleston in USA. There, the American Atheists are holding their annual convention. As they listen to talks on science, space and technology, and watch the eclipse together, they will experience no less awe at the wonders of the universe than did the ancient Shamash-worshippers. Although people remain separated by beliefs today as much as ever before, we share the basic human curiosity about our place in the universe and a thirst for knowledge. We’re lucky to live at a time when we can learn from so many other people, past and present. We have ever more information, and can better understand what it all means. We get to push back the fear, but keep the wonder. You can view the total solar eclipse on 21 August 2017 live on NASA’s website.